Has your flooring seen better days? When you’re ready to upgrade to more durable and attractive floors, come visit Steinbach’s Flooring Canada. At our showroom, you’ll find a wide range of gorgeous floors as well as an attentive team that guides you to the perfect choice for your home or business. Our ceramic wood tiles offer benefits that extend well beyond their looks. Because ceramic comes with a sealant on its surface, it stands up to humidity, moisture, and liquids. This means that you don’t have to worry about set-in stains or endless scrubbing. All you have to do is mop and spot clean when necessary. 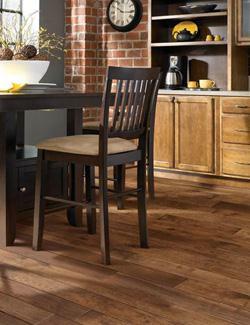 The non-porous surface of our wood grain tile also makes them more resistant to mildew and mold. With these floors, you not only get a cleaner space, but a healthier one. The last thing we want is for you to go through the selection and installation process only to be left with lackluster flooring. So we do whatever we can to ensure you make the purchase that’s right for your style and needs. Our professionals take the time to understand your remodeling goals and let you know if any of our wood-look tile brands can help you achieve them. We give you all the details you need to make an informed purchase decision. To ensure your complete satisfaction, we cover our 4 Star and 5 Star rated products with our Confidence Plus Warranty. This allows you to try select products out for 30 days. If you’re not in love with them at the end of that period, let us know, and we’ll replace them without charging for the additional labor. Contact us today to find tile that looks like wood. We proudly serve customers throughout Steinbach and Winnipeg, Manitoba, as well as the surrounding areas.